Its new and original airflow design is handsome, cunning small and exquisite, and its serviceability is superior ; its compass may facilitate your family life and outdoor tourism. Capable of mechanical power generation ; provided with accurate structure and high working efficiency ; its built-in high-performance power generation energy storage device is environment friendly. Three(3) imported high-luminance LEDs are used to serve as light sourcesm their lifespan can reach 10,000 hours or linger, ensuring high performance and energy conversation. Capable of alarm flashing ; in cars of an emergency, the product can be attached to the top of your auto for emergency resorting. The product may be used to charge up variouds types of mobile phones or digital prod. When your automobile develops a fault, you may use the razor blade to cut off the safety belt, and use the safety hammer to smash the glass so that you may escape as soon as possible. 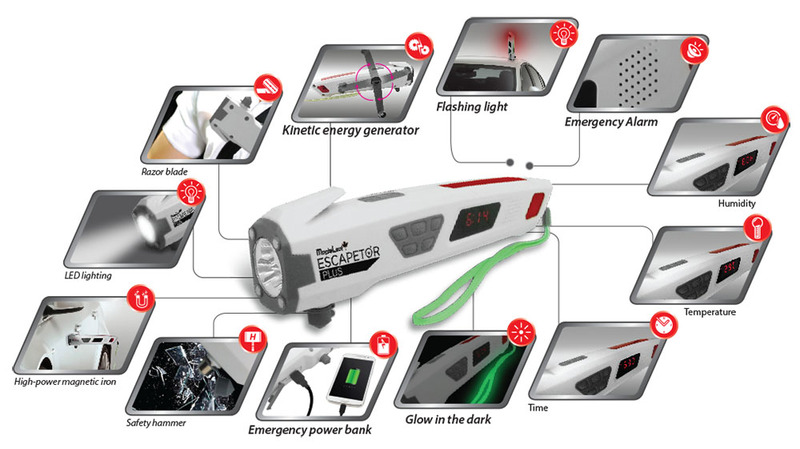 With functions of emergrncy lighting, mobile phone charger, blink /siren, rainproof, magnet, seat belt cutter, safety hammer, temperature, humidity, clock, alarm clock.